I finally have my dream kitchen! I can’t begin to express how happy it makes me!!! 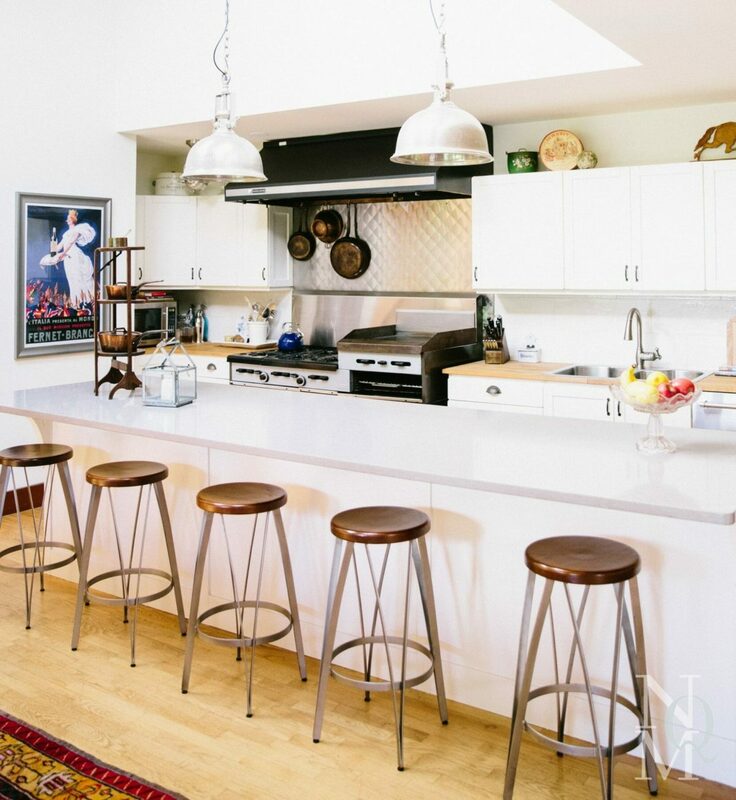 Like most kitchens, it’s the main hub for the family which is a big deal in and of itself, but factoring in that I enjoy cooking and love to entertain really bumps up the importance of my kitchen. It’s only been around 2.5 years in this house, I already have so many amazing memories of cooking, laughing around the kitchen island, and entertaining. I loved my last house, but the kitchen was so cramped that we constantly bumped into each other with even 2 people cooking, so this is a major improvement for family life. On most nights, at least 3 of us are helping prep, cook, and set the table. I have to do a little bit of bragging about Isabelle: she’s a fantastic chef so we have a lot of fun in the kitchen together! We almost always eat family dinner together and do our best to make everyday life fun with music, occasional dancing (much to Isabelle’s chagrin) and general family bonding time. We also have a tradition of having family brunch every weekend and Isabelle and I trade off who prepares it. But back to the kitchen…when we bought our house, it had two adjacent kitchens: the original wood tone cabinet one with rust Formica counters plus a large white one that was commercial in feel. The bigger one was created by a previous owner, a European chef and local restaurateur, when he took over the living room. Both had Kelley Green walls, dated counters, and a variety of dated appliances between the two kitchens. One funny note: in spite of being a really big combined space, neither kitchen had a refrigerator—it was around the corner, through a door, and in the laundry room! It did have a lot (and I mean A LOT) of cabinets and a bar with the original sink and dishwasher that broke up with two rooms and formed a narrowed walkway between them. Even after removing more than half the existing cabinets, I still ordered over 90 pulls when I replaced them! Even though the 2nd kitchen was a very large space, it felt crowded because the island was not only double the width that it is now, but also had an L configuration. And we had a few other issues to contend with: the lighting consisted of a long florescent strip, some old globe fixtures and two cheap metal spotlights none of which were over the island, no backsplash, and not to code 220 outlets stapled to the walls. Before moving in we removed the original kitchen and many of the upper cabinets and then had our painting firm kill coat the green and put a couple other coats of white paint on the walls. If you live in the Seattle area, I cannot recommend Coast to Coast Painting enough! Lewis and his team are so meticulous and professional that they’re always a pleasure to work with. Last, pre-move in we had to remove plumbing and electrical and patch the hardwood floor in the space where the original kitchen sink/bar area was. Next, we set to work ordering all new appliances and were lucky to have a brilliant sales person at a Seattle chain called Albert Lee. Mark VanDerMost suggested we get a full-sized refrigerator and full-sized freezer, then join them with a $350 stainless kit sold by the maker to create a fantastic (and huge capacity) built-in look set that was a fraction of other similar options. I cannot tell you how happy we are with it! We needed a lot of room with Steven and I, the girls, plus my father in the house, but it was even more important because living on a rural island means that we stock up and freeze things a lot more than we used to. Then Seth Branum, our super talented contractor, and I designed the custom surround for the fridge and freezer units (see above) with re-purposed butcher block from the long bank of counters we removed and new wood on the sides and top. Seth reached out to an iron designer he knew and she created the iron strap trim and shelf brackets (which I love) plus a coordinating back-splash for the cabinet bank opposite the sink and stove (see below). He also replaced the solid wood front door with a glass door that I found at a local Salvage Store which adds a lot more natural light to the space. The only appliance we kept was the Garland stove was left by the previous owner (the chef I mentioned had removed it from a restaurant he sold). It needed quite a bit of refurbishing and many hours of cleaning (thank you to my sister Alissa for this!) but all the work was so worth it! The bulk of the counters were replaced with grey quartz and we were so thrilled to find a supplier with a huge slab so that the island doesn’t have any seams but instead is one solid piece. The remaining counters are butcher block that we moved from elsewhere in the original kitchen. We wanted the butcher block to be near the knives and stove although if I had it to do over, I’m not sure I’d choose to put them by the sink. They’ve proven to be a pain to battle water spots on, but I’ve done ok with keeping them up thanks to butcher block conditioner. The white cabinets were here too but the overall style was really different: kelley green walls, white florescent track lighting & white thin cabinet pulls, no back splash, to name a few etc. The cabinets were not finished on the sides plus the back of the island so Seth mimicked the style of the cabinets and created panels as well as braces for the new island counter eating area. It took around 6 months for the bulk of the renovation to be done and around 6 more months to finish the last smaller detail touches. For the backsplash, we opted for distressed larger sized subway tiles and are very happy about the resulting look: clean yet a little different from the simple subway tiles we’ve used elsewhere in the house. The only big thing left to do is a redesign of the pantry which is currently a coat closet that opens into the hallway behind the kitchen. I’d like to expand the size of it some and have it open into the kitchen. I’ve been getting lots of inspiration on Instagram and Pinterest. The space won’t be very big so it’s going to require careful planning. I also want to remove the beam between the original kitchens and add recessed lighting above the window side cabinet bank. And last replace the wire pull outs (shown below) with nicer wood ones. In a few weeks, I’ll share the playroom that we created in the original kitchen space, but for now, I’ll leave you with a few detail photos and end with a full Source List.